For those just tuning in, this year for our annual ballpark tour we decided to travel to Southern California and visit Los Angeles and San Diego. We spent the week touring these beautiful cities, soaking up the beautiful California weather and following the Dodgers around SoCal. Hop over to this post for details from our LA trip and why we were excited to get to go to so many Dodgers games. We had to get up pretty early to get ready to drop off our rental car and catch our train from Burbank to San Diego. We rode the Amtrak Pacific Surfliner which traveled along the coast for the last part of the trip. The worst part was all the stops at the beginning part of the trip but we really enjoyed the ride. This was our first time riding a train like this and we were very pleased. There was plenty of leg space, outlets to charge our phones, a complimentary refreshments bar, plus it was relatively quiet. This was a double decker train so we sat on the top, which was pretty cool too. It was nice to just sit back, read a book and enjoy the view. We arrived at the Santa Fe Train Station a little before 1:00pm. We walked about a mile to our hotel to see if we could check in early and, luckily, they had a room available. We stayed at the Hilton San Diego Gaslamp Quarter, which was a beautiful hotel and perfect location. We briefly dropped off our luggage, freshened up and headed back out. Our first mission after dropping off our luggage: find some fish tacos. We asked the people at the front counter at the hotel if they had any recommendations and they suggested El Pulpo, which was just a few blocks down from our hotel in the Gaslamp Quarter. This was our first time trying fish tacos so we decided to try them grilled and fried – both were great, but I preferred fried! *Ladies, I will tell you, I’ve found my new favorite travel dress! It’s a lightweight t-shirt dress from Target and it is SO comfy! I wore this black one on the train to San Diego and I also have one in olive green, which I wore on the plane to LA. If they had it in 10 more colors I’d buy them all! *Also, I wore these Sanuk yoga slings every single day on vacation and they were amazing to my feet. Any other shoes I’ve ever worn on vacation have hurt my feet (even my comfy Yellowbox flip flops) so I wanted to find something this time that I could wear all week and not have a problem with. These were great! Definitely suggest getting a pair of these if you plan on traveling or being on your feet alot. After lunch we decided to tour the USS Midway Museum. This was something that was high on our to-do list and since we had about two hours before it closed we decided to go ahead and visit. This place is absolutely amazing! It’s an aircraft carrier that served in several wars and has housed hundreds of thousands of sailors. The nurse in me enjoyed seeing the infirmary and the OR. After seeing all we could see on board we had a little time to kill before the 6:00 ferry to Coronado Island. We walked over to see the big statue of the famous picture of the sailor kissing the nurse. David talked me into taking a picture mimicking the statue. We then caught the ferry headed to Coronado. I always enjoy riding ferries whenever possible. It was a bit chilly, though. We had planned on just walking around a little bit and then finding something to eat. Right away I spotted a little chocolate shop with these decadent caramel apples so we had to grab one of those to enjoy after dinner. We got the butterfinger caramel apple. It was the perfect after dinner treat! We were wanting a good seafood restaurant and landed on Peohe’s. This restaurant was stunning and the food was delicious! Our table was on the screened in patio and looked right over the water. Such a great atmosphere! We got the crab stuffed, parmesan crusted tilapia with yukon gold mashed potatoes. We’ve never had anything like it before and it was sooo good! On our ferry ride back to the harbor we were lucky enough to witness a fireworks show from the USS Midway. The ferry driver knew they would be shooting them off and drove slowly so everyone on board could enjoy them. I’d say we had a great first day in SD! We tried to call or facetime with the girls at least once a day. We loved seeing their faces and hearing their sweet voices! One place I had read about that I knew we just HAD to try was Wow Wow Waffles. I love Belgian waffles so this place was a must. It’s tucked in behind a laundromat – you’d miss it if you didn’t know what you were looking for. The way it was laid out was just so cute. We were within walking distance of Balboa Park so we decided to try to walk over to the zoo (the distance wasn’t long, but we did have to walk up and down a few hills). We thought about going to the zoo but we had other things we wanted to do before heading to the baseball game that night, so we decided to walk around and explore Balboa Park (plus it was much more pricey than I expected). I am so glad that we decided against the zoo. The El Prado area of Balboa Park has an array of Spanish style architecture that is absolutely stunning. We walked through the Spanish Village Art Center, then up and down El Prado, through the botanical building, and just admired all the other architecture around us. The Museum of Man – this building was stunning! If we had more time we would have toured it. You can pay a little extra to go up in that tower. I grabbed a Hibiscus tea from a little stand in El Prado (very good and different) before we headed to catch the bus toward Old Town. Old Town may have been my favorite part of the entire trip and we didn’t even get to spend much time there. Old Town was the first settlement in California and has an authentic Mexican atmosphere. We had heard that this was the best place for authentic Mexican food and this was absolutely the truth! I ordered the chile relleno with rice and David got a chicken burrito. This is without a doubt the best Mexican food I have ever had (and I’ve had ALOT!) We ate at Casa de Reyes which was in this beautiful courtyard area in the Fiesta de Reyes Plaza. There is a stage next to the restaurant where they often have free live entertainment including mariachi bands and folklorico dancers. We didn’t get to see any of this because we were there in the middle of the day but there was a roaming mariachi band performing table side at the restaurant. Chile Relleno – every time I think about it my mouth waters and I want another one right away! After we ate we walked around for a little bit, but not long enough. I wish we had a few more hours to spend there. As we were walking back to the transit center to catch the trolley back to the hotel I told David how much I missed it already and how I wished I had another stomach so I could eat another meal. The food, the music, the roaming mariachi band – everything here was perfect! We got to the game early that evening. We like to go a little early to watch batting practice and have time to roam around the stadium before the game starts. 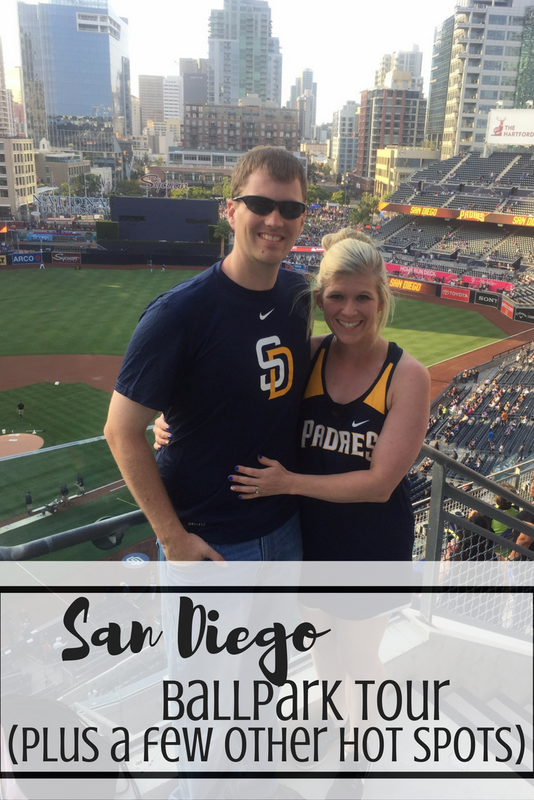 Petco Park was awesome – one of our favorites we’ve been to. There is an area in the outfield where kids can run the bases on a little field, or just run around in a little grassy area. The different levels, bridges, and lighting was beautiful. On the left side of the photo below you can see a brick building called the Western Metal Supply Co. It was built in 1909 and Petco Park was built around it. It still has the original look on the outside, but on the inside it now houses suites, a bar and a Padres team store. Even though this is a newer park, it still has history, which I love! [In case you missed the last post] It is our tradition to wear the home team’s fan gear the first time we visit a stadium. We had to continue tradition, even though we were rooting for the Dodgers! This was a great game! Austin Barnes hit a grand slam in the 1st inning and then a 3-run HR in the 6th for 7 RBIs. We also witnessed a bench clearing “argument” between the teams’ managers which got them both ejected. Grant ended up pitching 1.2 innings and did really well! Dodgers won 10-4. On our last day in this beautiful city we went to James Coffee near Little Italy for breakfast. We expected a normal little coffee shop but the actual coffee area is in the middle of a building called The “Space” that has a warehouse-like feel full of little shops, a florist and even a barber shop. I got a Mexican Mocha, which had a little kick to it and a croissant. We didn’t want a big breakfast because we knew we would be having a heavy lunch. After breakfast we Ubered to Ocean Beach. This was our first time ever using Uber and the app makes it so easy! It was a cloudy morning and somewhere between 70-75 degrees so it was a bit chilly. I had originally wanted to use this time to lay on the beach all day long, and maybe visit several different beaches, but the weather was cooler than we thought so we ended up not spending as much time on the beach as planned. We walked up and down Ocean Beach for a bit and even though there was a cloud cover I still wanted to lay on the beach, relax and get some sun. It was nice to just lay back and read a book in the sand for a bit. The reason we decided on Ocean Beach out of all the beaches in San Diego is because we wanted to go to Hodad’s for lunch. There ended up being a line down the block to get a table. David offered to wait in line while I walked across the street to Jungle Java, a little coffee/tea shop and garden. I grabbed a cup of iced tea, sat back in an Adirondack chair and read my book (Gone Girl by Gillian Flynn) while David waited in line. It was probably about a 40 minute wait total. Every place we’ve gone to has had such an open and unique atmosphere. I love it! The burger and onion rings at Hodad’s definitely lived up to the hype. I got a bacon cheeseburger, which was so good! Although, if I’m comparing the burger here to the one I got at Dog Haus in LA, I would definitely say that I liked Dog Haus better. This is a single bacon cheeseburger. This thing was huge! We got an Uber back to the hotel, changed clothes and then headed back out. We had decided the night before when we were at the ballgame that we were going to grab tickets to Saturday night’s game as well. We hadn’t planned on going to a fourth game, but we both just enjoy it so much that we decided to snag some cheap tickets. I told David that if we were going to go to another game then we would have to find me a sweatshirt. It got cold at night, especially in that top section. We walked to a little shopping mall set right in the middle of downtown. I found a Nike sweatshirt at Macy’s and we were on our way. We made our way down to Seaport Village and spent some time walking around there before the game. We sat on the wall right next to the water for a little bit, just trying to soak up our last little bit of time with this beautiful view. We had planned on eating seafood at Seaport Village but I was really craving some more Mexican. So we walked back to the Gaslamp Quarter and ate at Las Hadas Bar and Grill. This was different than Old Town but still good. I went boring this time – I got cheese enchiladas and rice. But they were very different than what we get back home because they were made with corn tortillas instead of flour and were very good! The rice was a cilantro rice. I typically don’t like cilantro because to me it has a metallic taste but it wasn’t overdone in this rice and was pretty good. We made our way to Petco Park one last time and arrived right at game time. It was another great game – Dodgers hit back to back homeruns in the 5th then in the 7th Chris Taylor hit a grand slam. We even witnessed a fight in our section a few rows in front of us. We have no idea what it was about but one guy fell down a few rows of bleachers. It was a little scary. Dodgers ended up winning 10-0. -Side note – what are the odds? – we went to four Dodgers games on this trip and didn’t get to see Clayton Kershaw pitch once! He was scheduled to pitch the Friday night game in SD but they moved him to Thursday against the Angels. He is just incredible so we were really hoping to see him start, but it just wasn’t in the stars this time. Maybe we’ll catch him in Atlanta sometime. After the game was a laser and fireworks show on the field, which was great! I’ve never seen a fireworks show quite like this one. We went to dinner with them after the game. We just had dessert and coffee since we had already eaten and weren’t all that hungry – they’re used to eating super late. It was so great to get time to sit down and catch up. It had been years since I had seen Grant and we had never met his wife, so we were incredibly thankful they asked us to come along and spend some time with them. We got back to the hotel after midnight, finished packing and then crashed. We had to be up before 5:00 am to get ready to catch our flight. We woke up about 4:45 to get ready, pack our stuff and head to catch the trolley toward the airport. We ended up taking the trolley to the Santa Fe Train Station and a shuttle bus to the airport, which dropped us off at the terminal. Figuring out the transit system was super easy with the latest version of Google maps on the iPhone. I was feeling a little nauseated that morning, probably just from going to bed so late and waking up early. When we got through security at the airport I grabbed a muffin and some iced tea (for some reason I was just not feeling coffee). This helped settle my stomach a little bit. We flew to Atlanta where we had a three hour layover. Those layovers always seem to go by much more quickly than you think they will. At this point we were just so excited to see our girls! We had such an amazing trip but we are happy to be back home with our babies. It has taken about a week to recover and catch up on sleep but I think we are finally there. I worked two days last week and I’m off this week, so we are planning on having some low-key fun while I’m off.